Once you have registered your new RM Studio license, you may need to deploy a new Standard, Regulation, or Controls Set. Open the Standards/Controls from the Navigation Tree under Common. After the Standard tab opens in the work space, click the to Add Standard. 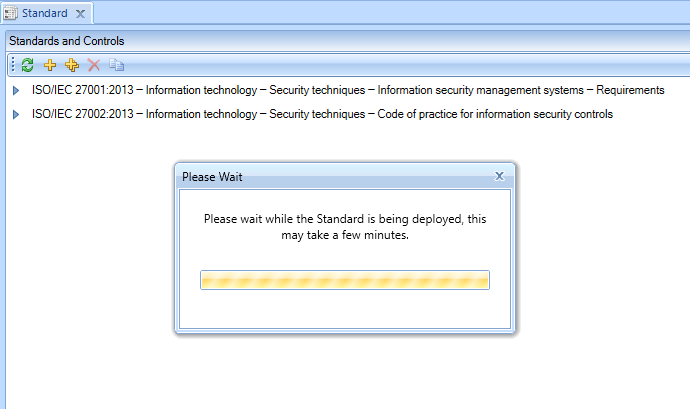 In the popup window choose the Deploy a Standard, then in the drop-down list, select the new Standard. Click the to begin the deployment. Now it is a good idea to review the newly deployed standard, both to ensure the deployment was complete and to familiarize yourself with the information and format. 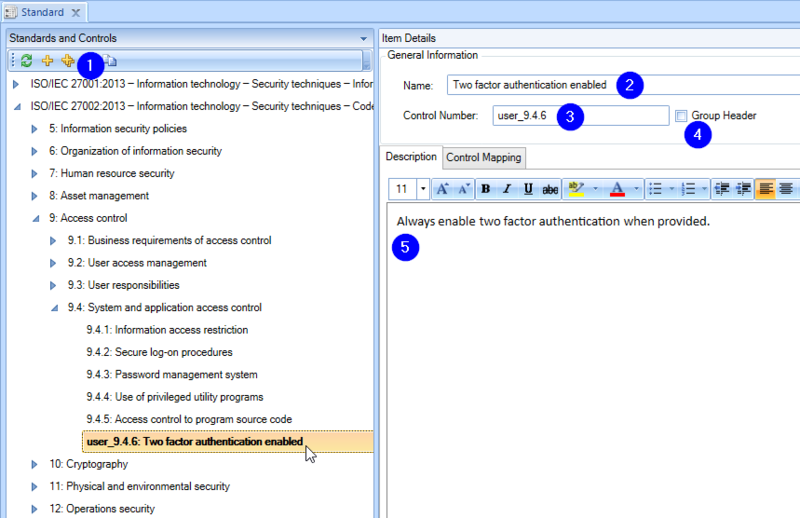 If you want to add your own controls, standards or regulations proceed to the User Defined Standards. Click the to open the popup for creating a new standard, regulation or controls for use in RM Studio’s Gap analysis and Risk Treatment. 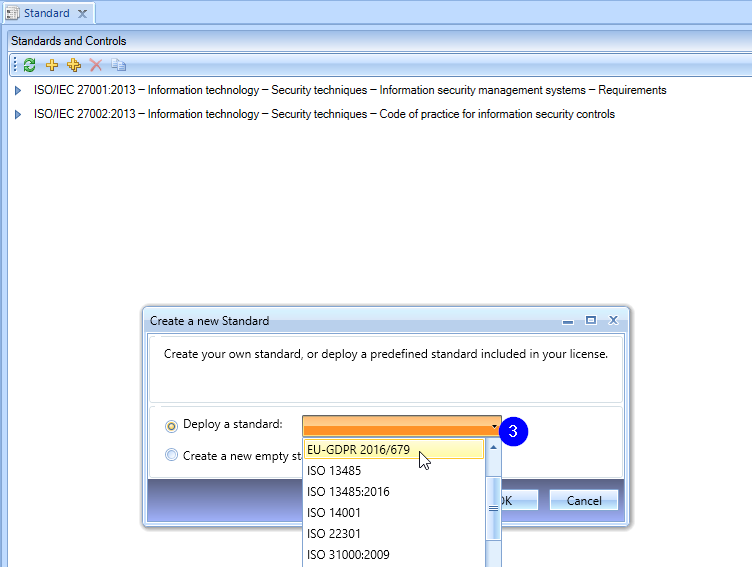 By default the ‘Create a new standard’ is selected; click the OK button to initiate the action. If you want to add to the deployed standards, regulations, or controls go the next section below about ‘How to: Add New Clause or Control‘. 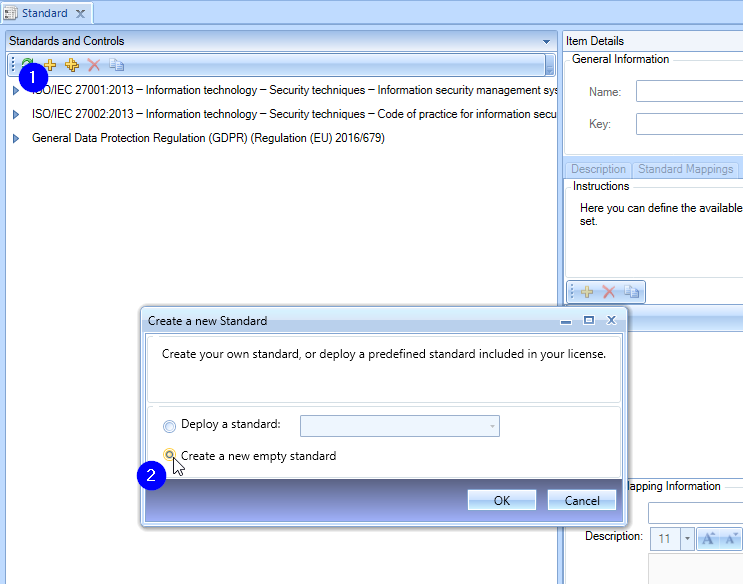 Select the ‘Create a new standard’ and then click OK button. 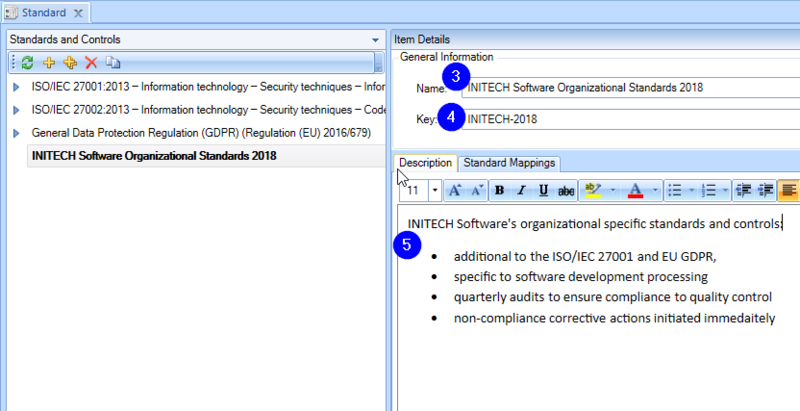 In the Item Details – General Information input a unique Name for reference of the new standard, regulation or control set. Input the Key name (shorthand name, e.g. GDPR) of new standard, regulation or control set. 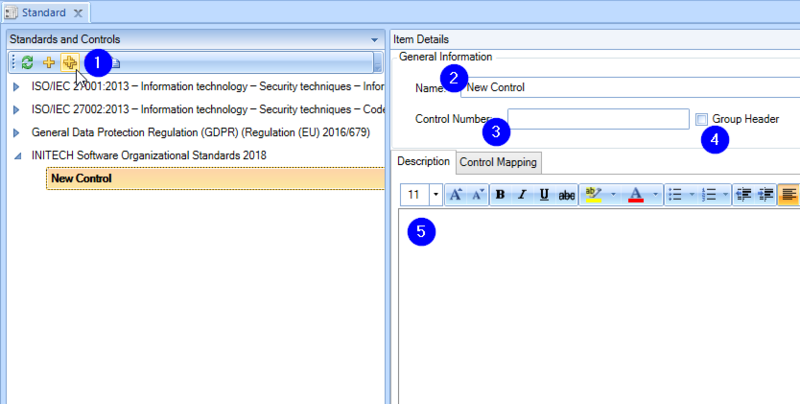 Input the Description of the new standard, regulation or control set and remember to be as thorough as possible in the description for other RM Studio users or stakeholders and auditors to clearly understand the new data. 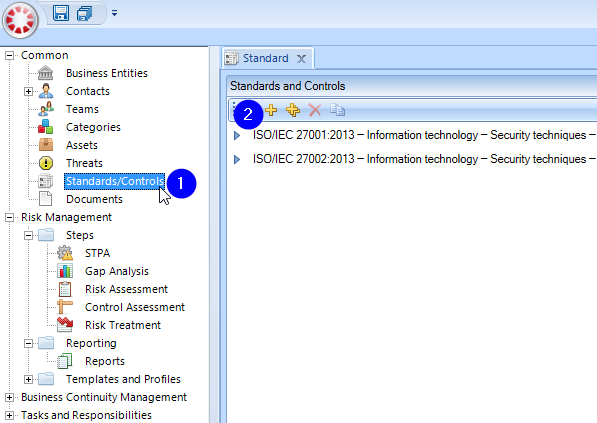 Click the to add a new line item under the desired standard/regulation/control set. 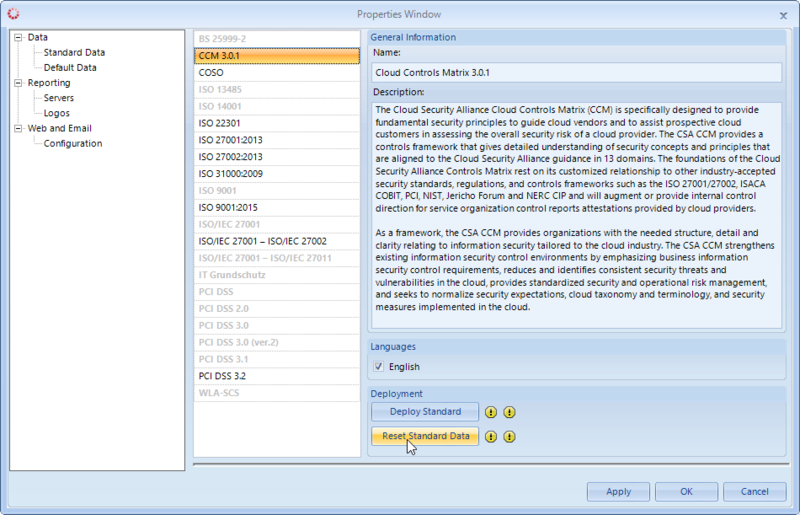 If the new control needs to be filed under a particular control group (already deployed), then select the ‘parent’ line item you want to add the new ‘child’ line item under. In the Item Details – General Information, input a distinctive Name for the new item, keeping in mind that others will be using the controls too. Input a unique Control Number and remember to be consistent with the numbering of the Standard/Control set you are adding to. Check the Group Header box if the new control is the head of a group of new controls. Group Headers do not populate in the Gap analysis or the Risk Treatment. The necessary actions for implementing the control are vital for clarity and consistency, when adding the new control. In the Description field, input the Implementation Guide or Protocol for the new control with clear and defined actions, so that other users can easily understand and consistently execute for a complete implementation. Save the new clause or control in order to index the item with the database table for control set. Access the Properties Window under the Main menu. ‘Reset Standard Data’ will return the data in the selected standard back to the original data.